Bar open Mon–Thu noon–11pm; Fri/Sat noon–1am; Sun noon–9pm. Food served Mon–Thu noon–2.30pm, 5–9pm; Fri noon–2.30pm, 5–10pm: Sat noon–2.30pm, 5–11pm; Sun noon–6pm. Elegant theatreland brasserie, with a great cocktail lounge bar and appealing lunch and pre-theatre options. Dine is an elegant first-floor brasserie, perched above the Traverse in the heart of theatreland. A stylish lounge bar with sink-in leather sofas showcases a strong wine list and great-value classic cocktails. Lindisfarne oysters kick off an appealing à la carte menu that changes with the seasons and runs from lunch to dinner in this contemporary, tastefully lit room. Pan-fried duck breast arrives drizzled with honey harvested from beehives on the roof of the neighbouring Lyceum Theatre, and dressed with red cabbage purée and light spring greens. Pretty-in-pink roast quail nestles in spiced Puy lentils and butternut squash, while john dory is paired with sea vegetables and sweet and sour grapes. A stripped-back market menu offering lunch and pre-theatre options features the likes of sea bass fillet with artichoke purée or haggis with root vegetable crisps and red wine jus. There are popular 'dine with wine' deals at the weekend, and a ground-level champagne terrace when weather permits, in a venue that works hard to please its audience. A new benchmark in the city, introducing a fresh, relaxed brasserie-style dining and drinking venue, featuring Edinburgh’s first dedicated 30-seat champagne lounge in the city centre. 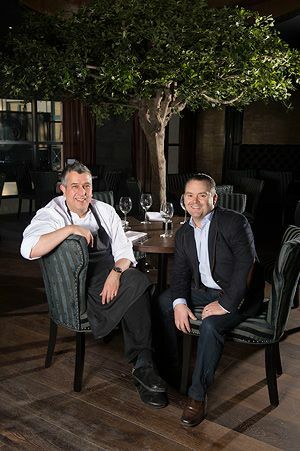 Brought to you by Stuart Muir, former executive chef of Forth Floor Restaurant Harvey Nichols Edinburgh and his business partner, hospitality entrepreneur Paul Brennan. The 80-cover brasserie is a stylish space for morning meetings and business lunches, vibrant pre-theatre dinners and leisurely brunches, with an extended Sunday brunch menu enjoyed to the soundtrack of live jazz. Whether you're after a quick bite or a more lavish pre-show meal, there are restaurants in Edinburgh of all cuisines with good, affordable menus to fill you up before you head to the theatre.